For a great chapter of his life, wilderness explorer John Muir made the rugged San Gabriel Mountains his muse. At first glance, he feared that the arid landscape was going to be too harsh and desolate for enjoyable human exploration, but once he got up close to the hidden nooks and hidden gems, he experienced a stark change of opinion. Eaton Canyon Falls, which is now accessible by way of a short 3.5-mile out-and-back day hike in the greater L.A. area, is described in his adventure journal thus, “It is a charming little thing, with a voice sweet as a songbird’s, leaping some thirty-five or forty feet into a round, mirror pool." 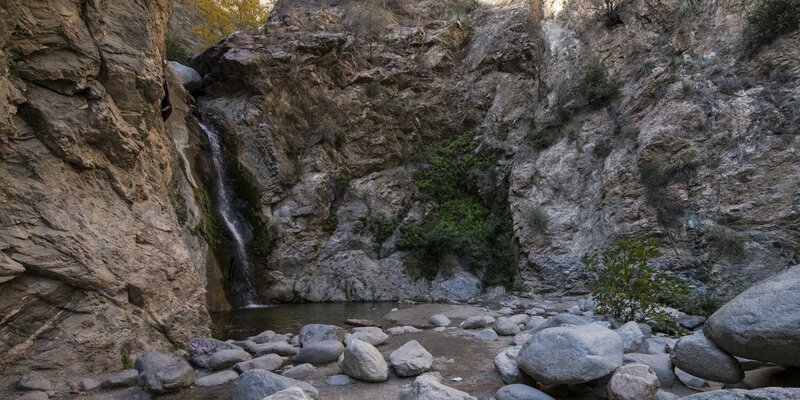 Eaton Canyon Falls. Photo by Tyson Gillard. This range is full to the brim of vistas and adventure, and it starkly juxtaposes the prolific, rowdy city over which it sits. For many, the San Gabriels provide a multi-day backwoods adventure, but for most, the great accessibility of breathtaking views and historical sights make these mountains a haven for incredible day hikes. The Griffith Observatory Hike via East Observatory Trail is one such hike. Along the 1.8-mile out-and-back trail, sweeping vistas of the city unfold, and the iconic Hollywood Sign comes into view as hikers make their way to the Griffith Observatory for a wealth of information on the telescopes that have taken residence there over the years and the discoveries they have assisted in making. Even though many of these day hikes call hefty crowds, it’s not without good reason. The Hollyridge Hike to the Hollywood Sign is typically bursting with people—hikers, joggers, and locals alike—though for the fabulous uncontested views of the iconic sign and the greater L.A. metro area, the crowds are well worth it. Likewise, the Mount Hollywood Hike via Charlie Turner Trail is crowded but slightly shorter, and it offers similarly excellent views of the sign. For those with a taste for more cinematic history, the M*A*S*H TV Set Hike is a blast back to the past. A flat and meandering 4.2 miles steers hikers along the original outdoor set of the famed television show, which also set the scene for a number of Hollywood films like “Tarzan Escapes” and “Love Me Tender.” Many of the set’s buildings and trucks sit slowly deteriorating around the site, giving off a nostalgic and memorable feel. Truly, it’s hard to go wrong with these and the additional six adventures below if you’re in Los Angeles and in the mood for a day hike. Pro tip: pack tons of water, a good camera, and bring along few good friends for these memorable, scenic and iconic day hikes.